“You are about to witness a new dimension in entertainment.” The voice is authoritative, and a bit ominous, like in the movie trailers that begin “In a world…” Out of the darkness, a man appears, his hair fluffed like Bobby Sherman’s, his collar spread wide like pointy white seagull wings. He sings, and it’s not clear what the announcer is talking about, what this new dimension might entail. Peter Lemongello is handsome enough; he seems like the kind of guy you’d see at the bar at Maxwell’s Plum, offering to buy a lady a Harvey Wallbanger, and because this is the mid-1970s, his clothes are ridiculous. There is a yellow get-up that reveals way too much man-cleavage. This two-minute introduction to Mr. Lemongello will run repeatedly on television: it’s a commercial for a record album called Love ’76, and before long that album will have sold well over a million copies (probably, but not officially: there are no R.I.A.A. statistics for it), just through mail order. There will be sold-out live appearances, write-ups in The New York Times and the Wall Street Journal. Because, amazingly enough, no one thought to do this before, buy fame in 120-second installments, convince viewers to send $6.98 ($8.98 for 8-track tape) for an album by an artist they’d never even heard of. It was like a real-life version of the 1954 movie It Should Happen to You, where a struggling actress (played by Judy Holliday) rents out a billboard in mid-Manhattan for the purpose of getting attention (it’s a much better film than that Three Billboards… thing, by the way). It worked for her, and it worked for Lemongello. Love ’76 is an album that’s not remembered for its music, but for its marketing, and in that sense, it’s sort of brilliant. It was all what we’d now call “branding,” selling Lemongello’s image, calling what he was doing “Mood Rock,” a term as evocative as it is meaningless, but what did that matter? A year before, an awful lot of people bought something called a Pet Rock, and there is not that much difference between a Pet Rock and Lemongello’s Mood Rock: once it came in the mail you thought, What do I do with this now? You played the double-LP once or twice, maybe, and then it became just an artifact that’s in your house, an impulsive purchase. Before you spent your money, you’d never heard a complete Peter Lemongello song on the radio in your life, and now you owned this. What Lemongello figured out was, if a singer appears a couple of times on The Mike Douglas Show, he’s just one of a parade of musical guests that gets a few minutes of airtime. The next day and the day after that, new singers will take his place. But if you make a commercial and show it over and over again, flash your name on the screen in big letters, sing just enough of a song to indicate what you’re up to, a number of people–maybe more than a million!–will reach for their phones out of curiosity. He didn’t have to compete for airplay. He’d already done that, in the early ‘70s, and that didn’t work out so well. There were a couple of singles on the small Rare Bird Records (“Groovy Little Things” and an old Bacharach-David song, “Rain From the Skies”), another one on Mark V (“Contemplation”), and he was even briefly on a major, releasing “Mary Lee” on Epic. You most likely never heard any of those. So he had to take control of his own fate, raising money from private investors to finance an album and a campaign. In an earlier era, he might have been positioned as a Bandstand teen idol, one of the lower-tier ones, like Johnny Restivo or Frank Gari (and someone would have shortened his name to Peter Lymon). Or he could have taken the nightclub route, singing Sentimental Songs for High Rollers, like Al Martino or Jimmy Roselli (whose biography is titled Making the Wise Guys Weep). But in the ’70s, the logical route was down the middle of the road, like what Neil Sedaka (“Laughter in the Rain”) and Frankie Valli (“My Eyes Adored You”) were doing. So he got Teddy Randazzo to co-produce, arrange, and cowrite most of the original material for Love ’76. 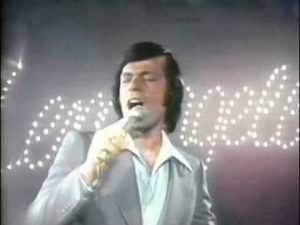 Randazzo had written some major-league big ballads, “Goin’ Out of My Head,” “Hurt So Bad,” “It’s Gonna Take a Miracle,” and a few songs for Frank Sinatra, and for Lemongello, he and his collaborators took an approach that was part Barry Manilow, part Barry White-Lite, PG-13 seduction: “Come closer, baby,” the album starts off. “It’s the moment of truth.” Smooth talker. One of the non-Randazzo songs is credited solely to Paul Anka on the LP credits, but that’s not accurate. “Do I Love You”–featured prominently in the ad: “Do I love you, don’t you KNOW by now?”–started off, like some other Anka compositions (“My Way,” “Let Me Try Again”) as a French song (“Plus rien qu’une address en commun”) that he loosely adapted into English. Anka had released it as a single on Buddah, and it had also been covered by Scott Walker (below). When Lemongello signed to a real record label, Private Stock, “Do I Love You” became the title track for his next album. But that LP never cracked the top 200. That’s the twist in the story: Lemongello orchestrated the launch of Love ’76 to separate him from every other struggling singer, to gain credibility through visibility, but once that happened, and he was on a regular label, he was on the same playing field as everyone else, another mainstream easy-listening singer angling for attention and airplay (even on Private Stock, his album came out in between albums by David Soul and Frankie Valli, competing in the same arena). What was special about that? Lemongello became, then, the only artist to sell a million albums without once making Billboard’s LP or singles chart. “They’re calling me an innovator,” he told The New York Times, “because I went directly to the public. I wasn’t innovating anything. I was trying to be a star.” After him, artists such as Slim Whitman and Boxcar Willie hawked their music on TV. After him came Home Shopping Network and QVC. Today, all aspiring Lemongellos have so many avenues for exposure: Instagram, YouTube, Facebook. You can go on American Idol or The Voice. It’s easy to become famous for a while, if famous is all you want to be. Peter Lemongello figured that out more than four decades ago. The album never sold a million copies, otherwise it would’ve made the Billboard and Cashbox album charts. According to Both Sides Now, a record label database online, Love 76 sold around 43,000 copies in the New York area. A number of artists who sold many albums through direct-order TV advertising, like Boxcar Willie, Zamfir, etc., never appeared on the Billboard and Cash Box charts. Neither did K-Tel and other TV-marketed compilations. Those trades, in the pre-SoundScan era, tracked sales through traditional retail accounts, so those albums wouldn’t have shown up in their statistics. Either way, copies of that album are rare. Indeed I’ve never even seen a copy in person. Records that sell in the millions are seldom this rare. I believe this album sold only the 43,000 copies listed on BSN. The single from the album (which was not sold via TV) failed to chart, as did all of his previous and followup singles and the LP on Private Stock.